Sick has created a solution piece involving a real-time measurement system using the company’s 3D laser technology to provide accurate, non-contact and fast measurement of cattle height data to predict performance and optimise feeding and management. The Beef Cooperative Research Centre (CRC) was established to identify the genetic and non-genetic factors affecting beef quality and other production traits of economic importance. Founded by the Commonwealth Government, Cooperative Research Centres (CRCs) are considered 'Engines of Innovation'. CRCs pull together researchers and industry to develop new products, services and opportunities of immense value and benefit to the Australian economy, industry, environment and community. Since 1993 the Beef CRC has delivered on its promise of enabling the beef industry to reliably meet beef consumer specifications. Crossmuller Pty Ltd specializes in technology solutions for Australia’s industrial sector. Originally formed in 1989 management created the Crossmuller name in 1999 to take advantage of the growing need for specialized software solutions in manufacturing and supply. 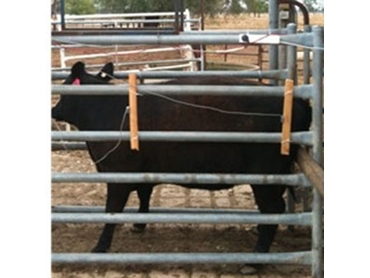 The company was tasked with working with the Beef CRC, a Cattle Management firm and SICK Australia to provide a solution for automated animal height measurement and storage. Currently animals are measured manually using a tape measure while the animal is stationary in a cattle crush. This operation involves extra labour, has issues with variability and marginal OH&S concerns. The requirements of the measurement system were to use a non-contact method which allowed for automated and rapid animal height measurement and storage. The system must be robust enough to handle the harsh environmental conditions found in a typical feedlot. Stored data was required to be formatted for easy importing into standard analysis tools such as Microsoft Excel. SICK’s laser measurement technology was selected as the ideal measurement device for the task. 3D laser measurement technology (LMS400) scans the rear portion of the animal to provide an estimate of height at the hips. The LMS400 3D laser measurement technology is rugged and able to handle the outdoor conditions found in typical feedlots. The LMS400 was mounted above the cattle race. The LMS400 is automatically moved through a forward stroke to scan the rear portion of the animal. Animals can be scanned while stationary in a suitable section of the race, which could be before or after the crush in which the animals undergo weighing and other operations. 3D profiles along the animal’s backline created by LMS measurements, are used to estimate the animal’s hip height with reference to the ground by accounting for the affects of animal hair patterns and body shape. The ground reference is measured during a calibration routine run when the system is initialized. Data for each animal is displayed on the user interface and is also stored to file for later import into analysis software. Future versions of the system will carry out the analysis internally without the requirement of other applications. While this feedlot installation is optimized for use with a stationary animal, the system is able to be adapted for use with animals in motion through the race, such as in a saleyard or other handling facilities. The height estimate, coupled with the animal’s age, generates a ‘frame score’, which is an indicator of the maturity type. This is used in conjunction with other parameters to predict the pattern of growth, and final fatness for the live and carcass weight at the end of a period of growth. The solution provided by Crossmuller Technology has allowed for fast, accurate, non-contact, automated animal height measurement and storage. The system avoids any possible OH&S issues associated with the manual measurement methods employed prior to the system deployment. Looking forward this system can be employed in remote locations such as watering points, to collect and transmit animal height data without cattle having to be transferred to central stations and losing weight in the process.